No successful company has ever left its brand and branding to chance. Instead, smart companies are intentional and public about their mission and values, among other things. There’s a good reason for this. 87% of consumers will purchase a product solely because of brand values. In 2018, we saw some terrific examples of strong branding and several strong rebrands. But we also saw many terrible branding mistakes that could have easily been avoided. Let’s look at the best and worst branding of 2018, including tips on how to create a successful brand experience for your own business in 2019. Alexandria Ocasio-Cortez’ unconventional campaign is an excellent example of the influence strong design has over social, cultural, and even political movements. Political campaign branding typically centers around traditional, familiar interpretations of American patriotism. Alexandria Ocasio-Cortez’s campaign took advantage of this widely held expectation by turning it on its head. Unorthodox branding choices were a hallmark of Ocasio-Cortez’s campaign. Those choices marked a serious departure from prosaic design constructs, and the message to everyone watching was clear: this candidate is different. 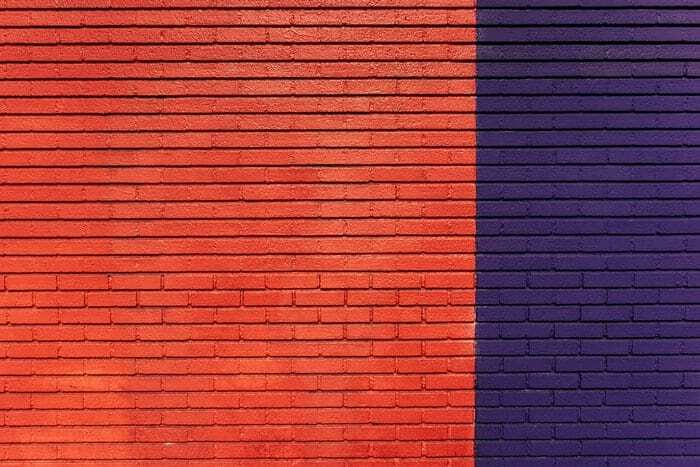 Political marketing strategists and consultants traditionally rely on a specific set of (red, white, and blue) visuals in their campaign materials. These conventional designs communicate the dignified, staid character of equally conventional candidates. 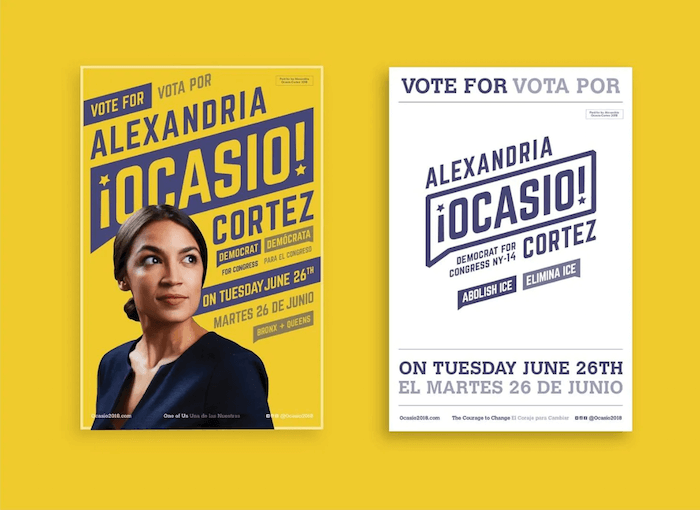 Ocasio-Cortez’s use of dynamic, engaging design in her campaign materials was an intentional rejection of wonted political design practices. Ocasio-Cortez’s used purple, yellow, and other bold choices to visually differentiate her campaign from her opponent. Her political branding strategy was to sound different and to look different. It’s no surprise that Ocasio-Cortez created a compelling argument for shifting toward a revolution – in design and in politics itself. By incorporating her persona as a radical candidate in her election designs, Ocasio-Cortez lent authenticity and strength to both her branding and her enormously successful campaign. Like a successful political campaign, good branding is based on something meaningful and genuine. A staggering 91% of consumers said that they are more likely to buy from an authentic brand than from a dishonest brand. Whether your brand draws on personal history, brand vision, or a radically new perspective, make sure your designs reflect something purposeful and genuine. There’s no doubt Uber came into 2018 on the heels of a terrible couple of years. Lead by Wolff-Olins, this rebrand concentrated on Uber’s worldwide presence by focusing on a simple, universal wordmark logo. It uses a friendly, rounded typeface created specifically for the company. The logo was accompanied by a host of support materials that were also well-executed and internationally-focused. Uber’s new logo incorporates a sense of mobility, accessibility, and friendliness not found in previous iterations. The clear intention was to create visual and psychological distance between the brand and its soured history. Compared to the company’s previous branding attempt, the new logo is clean, clear, and unpretentious. It may have been one of the simplest redesigns of recent memory, but with this, Uber cleaned up its image as it cleaned up its brand. If your business is struggling to overcome a negative reputation, take a cue from Uber. A rebrand and a professionally designed logo is a powerful demonstration that your business is committed to a fresh start, and can drive your brand back to success. Whether you’re creating a new brand identity or rebranding an existing one, be sure you’re up to date on modern logo design trends. What is a rather staid business like DuPont doing in a best-of branding roundup? Our choice may be unusual, but the company’s 2018 rebrand is more proof that the simplest ideas are often the best ideas. DuPont is an enduring brand, having been around since 1802. That’s an impressively long time to have the same branding. This might make the fact that DuPont chose to rebrand surprising, but the company had many good reasons. After years of bad publicity and court battles, the company was in dire need of an image makeover. Lippincott, a design agency known for its work with companies like Starbucks, Taco Bell, and Duracell, approached the rebrand in a way that honored DuPont’s roots with a friendlier execution. The designers made the logo friendlier and more approachable by emphasizing the squashed football shape of the original logo. It’s a very familiar shape that’s also welcoming. It’s idiosyncratic in its expression, but that’s also what makes it human. The rebrand keeps a visual nod to the longevity of the company through the use of some retro-looking type. If your business has an enduring history but is looking to move into the future, don’t throw the baby out with the bathwater. Be sure your new logo takes advantage of your business’ storied reputation, and include appropriate visual nods to your track record of success. Mailchimp’s redesign in 2018 is an example of how rebranding can work to showcase a business’ growth and evolution. It’s important for businesses to approach their branding with thoughtful consideration for what the future may hold for their brand. Having inflexible design can box you into an overly narrow market once your business grows beyond its initial purpose. Every brand should be able to scale their designs alongside business development in order to maintain a cohesive brand identity. We didn’t want our brand to feel disjointed, so we created a more unified and recognizable system by weaving the new brand identity throughout all facets of Mailchimp, from our customers’ accounts to our website, and from our marketing to our support channels…With this redesign, we set out to retain all the weird, lovable elements that endeared our earliest customers to Mailchimp, while creating space for the brand to grow and connect with even more small businesses. Mailchimp’s rebrand maintained the history and charm of the original design, while simultaneously looking ahead to include the endless possibility for what’s next. We always recommend our clients approach their branding as Mailchimp did. Use broad strokes when coming up with important branding elements like your business name and logo design. That way, you avoid limiting your business’ growth with rigid branding. It’s hard to know what Heineken was thinking when they created this TV ad. Meant to highlight Heineken Light, the ad quickly drew scorn and criticism for its incredible tone-deafness. The ad features a bartender sliding a bottle of Heineken Light past three black people into the waiting hand of a much lighter-skinned woman. As if that wasn’t enough, the ad’s tagline “sometimes, lighter is better,” surfaced the ad’s underlying message in a clear and controversial way. Heineken’s apology was warranted, as this ad’s design and slogan are a clear failure. The lesson here is also clear: no amount of ambition or intention can make up for a design that doesn’t seriously consider its implications. Melania Trump’s Be Best initiative aims to help children be their best selves, as well as an active force against the opioid crisis, a force for improving well being, and an ironic nod toward respectful behavior on social media. Melania Trump designed the ‘Be Best’ logo herself. She likes clean lines, and wanted something that would appeal to children. The logo does, indeed, present as childish – and has been widely derided. Descriptions like “Toddler MS Paint scrawl” reflect the overall impression the logo has left with designers everywhere. The poor design work, unfortunately, is not the worst offense at hand. Melania is alleged to have filched the design and much of the material in Be Best’s brochure from a 2014 FTC report on cyberbullying. What’s more, Time magazine noted that the phrase itself, “Be Best”, is uncomfortably familiar. It bears a striking similarity to former first lady Michelle Obama’s celebrated “Be Better” response to Oprah Winfrey’s question at the White House Summit on the United State of Women in 2016. If any lesson is to be learned here, perhaps it is this: any business looking to put forth marketing collateral of any kind would do well to be best at using Grammarly’s plagiarism checker. If there is one thing more devastating to a business than ugly branding, it’s stolen branding. The Travel Channel is a specialty TV channel owned by Discovery, Inc. that broadcasts documentaries, reality TV, and other shows related to travel around the world. The network name remains the same, but there’s a visually abbreviated handle (“Trvl”), an updated type treatment and a more subdued color palette. In addition to the unattractive color palette and typography, the logo’s missing vowels caused some confusion amongst brand watchers. The rebrand was done by LA-based agency Radley Studios. They only had four letters to integrate and each of them look like they belong in different fonts, while the arrow shares none of the traits of the letters. Based on the promo video, it looks like Travel Channel is now about haunted places and paranormal stuff…but the scariest thing you will find in their programming is this new logo. Rebranding can provide any business with an opportunity to stand out by showcasing the things that make a company different and better. Unfortunately, the Travel Channel’s new logo fails to evince evidence of their new direction in programming in any meaningful way. If you decide your business is ready to rebrand, don’t isolate your core market with changes that feel confusing or nonsensical. Make sure you thoughtfully execute any major changes to your branding so that your mission and values remain front and center. For more strategies for rebranding your business, check out How to Successfully Rebrand: Everything Your Small Business Needs to Know. Sports has had its share of branding disasters. It’s hard to forget the debacle that followed the 2012 London Olympics logo, or the nightmare that is Gritty, the Philadelphia Flyers new mascot. The same fate seems to have befallen the logo for the 2018 European Championships. The rebrand, created by London, UK firm Designwerk, was meant to showcase the multi-sport and multi-national event through an array of shapes and colors. 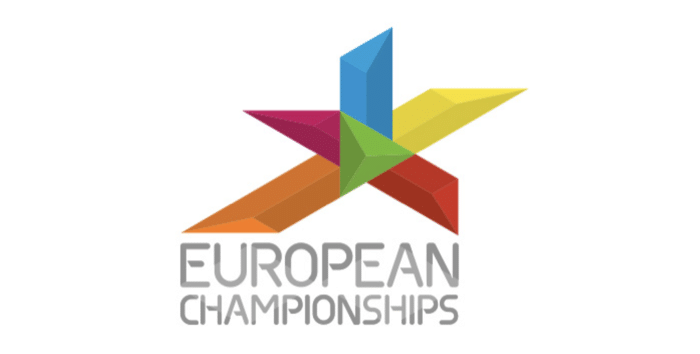 The European Championships logo attempts to achieve this by using multiple colors and shaded typography that will be difficult to reproduce at smaller sizes. The 3D nature of the shapes in the logo is also problematic, with different shapes and angles competing for attention. The overall effect is awkward, complicated, and jarring. This logo is a good example of what can go wrong when you have too many elements competing for attention. Take a moment and think about the most famous brands you know. Most likely, you’ve thought of companies like Apple, Volkswagen, Target, McDonald’s, etc. What do they all have in common? They all have logos that are simple and easily recognized when printed in color, grayscale, or in black and white. If your business is tempted to illustrate a complex message or theme, consider narrowing your focus. Good design is one that a viewer will remember, and more often than not, simpler designs are better remembered. And after all, if you aren’t being remembered, you’re being forgotten. Poor design, ineffective marketing, inconsistent messaging, and bad partnerships can all tarnish a brand. Take stock of how other brands use original design and thoughtful, consistent messages to stand out from less successful brands. It’s easy to see how smart, polished design can make the difference between enormous success and colossal failure. In 2019, make sure your business is equipped to succeed with outstanding design.